During the course of this paper I will be attempting to prove that the modern day capitalist bourgeois-proletariat contract is just as coercive as the "forced taxation" that modern day Libertarians and Anarcho-Capitalists complain about. I aim to prove that the "agree to this or die" mentality inherent in any profit driven labor contract is no more "just" than the tax man coming to your door telling you to hand over your money. If one works within the framework of the non-aggression principle* and the moral philosophy of Stefan Molyneux in Universally Preferable Behavior then one ought to reject the capitalist bourgeois-proletariat contract as being "unjust" and "another form of coercion". At this point it must be noted that I do not intend to prove that coercion is either a moral or immoral thing, I merely am attempting to prove that bourgeois-proletariat contract is coercive and therefore is immoral under the framework laid out by modern Libertarians and Anarcho-Capitalists. The issue of an apriori ethical framework shall be in a later post, this one is building off existing frameworks. In this part of the paper I shall lay out some basic definitions and ideas that will be used to advance the argument. First off, the bourgeois and the proletariat are two dialectically opposing social classes; the former being the class of capital (namely, the means of production), the latter being the class of labor (namely, workers within the means of production). According to Marx it is the proletariat who who create value for an object (but that is getting into the labor theory of value which, as well, is a topic for another post). The bourgeois-proletariat contract, as I would define it, would be the "mutual agreement" upon which labor gives up part of his or her freedom to work for capital. The contract is a, technically, voluntary agreement that the forces of labor sign into whereby they work to produce wealth for the forces of capital who in turn give them some of that wealth in the form of a wage. The coercion that the Libertarians and the Anarcho-Capitalists speak of in the context of taxation is the threat of violence, namely imprisonment, if one chooses to not pay his or her taxes. The fact that must be mentioned here is that this form of coercion is, technically, voluntary as well yet it is still considered a form of coercion. The framework laid out by Libertarians and Anarcho-Capitalists states that the initiation of force by a party, if not in self defense, is a violation of either Lockean property rights or a person's right to life or liberty. There are a whole slew of reasons why this is, supposedly, an apriori moral deal breaker but for the purpose of this post I shall assume that they are valid and shall work within this framework. The framework laid out by Molyneux in Universally Preferable Behavior is in much the same vain but it deals with the acquisition of knowledge and the search for truth. Again, I shall not attempt to validate or disprove the thesis laid out by Molyneux and others, I shall just work within it. With that being said, let's talk. Why is taxation immoral? According Libertarians and members of the Austrian School, taxation is immoral because it is a direct initiation of the threat of force. What happens in the context of governmental taxation is that a law is set that says that you must pay a form of tax (save for government approved exemption) else "men with guns" will come to your house and put you in jail. This, as is argued, is a form of coercion because the threat of violence is invoked to achieve an aim, namely, to acquire money. The crux of this argument lies in claim that the threat of force alone is enough to constitute coercion. This same argument applies to someone robbing you. They are threatening you and while you have a choice to say no that is not a wise move. Now here is where we get into an issue and that is of choice. Taxation, much like succumbing to the robber, is a choice. You do not have to comply with the aggressor however it is said that instances such as these are a false choice. With taxation you have multiple options, you can pay your taxes, you can say no, or you can leave the country (with the robber it is functionally the same). This is important because it highlights that while there is technically a choice, the threat of force, be it overt and in your face as is the case with the robber or be it subtle and far off like taxation laws, nullifies any form of choice that one actually has and thus constitutes a form of coercion. So here we reach the question of the bourgeois-proletariat contract. This contract, as mentioned in section 1, serves to "unite" the forces of labor and capital under the auspices of bolstering each individual's economic standing. This contract is presented as a choice to the worker, a choice which the presenter knows full well the consequences of. The forces of capital, owning the ability to provide for the worker, can thus make the terms of the contract and set a wage for which the worker shall receive and this wage can, and as is the case most of the time in the context of big capital, be very low. The bourgeois owner knows that in order for the worker to survive they must make a certain amount of money and thus the worker will do most anything to achieve this amount. The worker also knows full well the consequences of not making this amount of money, death. Thus the worker is given a choice, to accept the contract or die. Now before I move on there may be numerous issues raised here that I shall address. First off, one could say "well, the worker does have a choice, they don't need to work for anyone". The issue with this is that if one buys the premise that even the subtle threat of force, as in the case of taxation, is enough to nullify a technical choice than one must also extend that logic into this area. The owner knows full well that if the worker does not work for him/he s/he shall die and the worker realizes this as well and is willing to sell themselves to the lowest bidder for work. And thus, this is a subtle form of coercion similar to that of taxation. Following that one could say "well, the owner isn't directly threatening the worker". While this is technically true, society has instilled upon the worker the notion that he cannot be self sufficient on his own and thus needs the owner. This fact is known by both the worker as well as the owner and thus allows the owner to set a low enough price to still exploit the worker but keep it high enough so the worker has a false sense of hope. The owner is consciously trying to subvert the worker's efforts to advance in life and thus perpetuates the notion of "join or die". Any economic system in which an individual owns the means of production is subject to this subtle form of coercion and subversion. Following that one could say "well, the worker could just go to another company". The issue with that is that it is the same everywhere. All companies that aim to make a profit will do this and thus cause a subtle form of economic coercion upon the individual. This argument also is in the same camp as an individual moving to another country to avoid taxation (or having Swiss bank accounts if you're Romney) as shall be seen in a second. Next one could say that "the companies will compete with each other for the worker and thus will pay him/her increasingly higher wages" and this may be true for a very short while. In the short term, this form of competition and wage increase holds true but after a point all parties involved will see that they are losing money and thus will all agree to set a specific price that they are willing to pay for the worker. The fact that companies will work together to secure their profits is an argument made by Professor Aeon Skoble over at Learn Liberty in his video Social Cooperation: Why Thieves Hate Free Markets. Companies, even in the face of fierce competition will realize when they are losing money and will thus work together to set a price ceiling so to speak. That is why, in my opinion, minimum wage laws (if one is living in a statist society) are needed (but that will be a post for another time). Thusly, the owner of capital knows full well the consequences of his/her actions on the worker and that acknowledgement of the death of the worker sans adequate pay, which will not be received in the modern capitalist system, constitutes a form of economic coercion (albeit it subtle). But it is not just that, this subtle form of economic coercion forms a type of wage slavery. 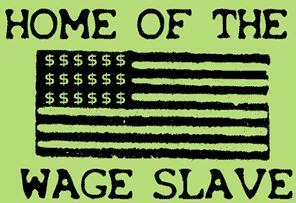 Wage slavery is defined as "...a situation where a person's livelihood depends on wages, especially in a total and immediate way..." and the bourgeois-proletariat contract constitutes a form of wage slavery because the worker is convinced that that survive they need the measly income provided by the owner of capital and they will do anything to achieve it. If one buys the Libertarian/Anarcho-Capitalist argument that the threat, either overt or subtle, is a form of coercion and nullifies any technical "choice" than one must also apply this same analysis to nature of wage slavery in modern capitalist society. The bourgeois-proletariat contract is no less coercive than the threat of imprisonment for lack of a proper tax form. The bourgeois-proletariat contract relies on the notion of subtle economic coercion to achieve one's goals for increased profits and thus, under the framework of the non-aggression principle and the notion of universally preferable behavior, must be rejected. *The non-aggression principle (or NAP) is basically a moral philosophy saying that the initiation of force against another person's life, liberty or property is an inherently immoral action. Under the NAP the act of collecting taxes is akin to robbery as it is an initiation (or threat of initiation) of force upon a party for material gain. 1: "Quotes About Capitalism." (207 Quotes). N.p., n.d. Web. 18 Sept. 2012 <http://www.goodreads.com/quotes/tag/capitalism>. Peter you are absolutely right. But merely abolishing the owners of capital is not enough for the workers to be free. We must also abolish the consumer, for the consumer is the ultimate exploiter of the worker. Workers will not be truly free until they are free of the aggressive demands of both the consumer and the owners of capital. I completely agree, however, I would argue that once the private ownership of the means of production is abolished, the consumer will fall as well. Once we transition to a more sustainable system then the consumer will fall as well. So your argument is work for others or die? If the only way you can live is by working for this imaginary giver of life/bringer of death then of course it violates the NAP. You are being forced into it under the threat of death. I don't think (or at least I hope that isn't) the point you are trying to make. I think you are saying that we need things to live such as food, water, shelter and if we don't have those things we will eventually die and working for others is a way of getting those things, be it directly via barter or indirectly via money. If that is what you are implying than your argument is flawed. People have to work to survive and they aren't coerced into this by anyone. We need food and water and protection from the elements. We will either get it directly by gathering/building it or indirectly by buying it from others. The only way "sign or die" applies is if all the food, water, shelter and basic necessities to maintain life are controlled by someone else and to access these things you must work for someone else. A situation like that is not free-market capitalism and it violates the NAP. Our current system depends on wages, taxes are at the very root of it. One needs to pay taxes to own land, so one must work to pay those taxes, taxes can only be paid in USD, We are required to trade in USD, and only the FED prints USD. The argument against taxation is an argument against wage slavery. "modern capitalism" not free-market capitalism, it is not about voluntary interactions, it is corporatocracy and crony capitalism and us Libertarians are against it too. How do you suppose the consumer (you and I) are going to satisfy our needs then? >First off, the bourgeois and the proletariat are two dialectically opposing social classes; the former being the class of capital (namely, the means of production), the latter being the class of labor (namely, workers within the means of production). This presents a leap of logic. The fact that certain people own capital and certain people don't, doesn't necessitate that they are "dialectically" opposed or contradict each other--that's a Marxist axiom. I wrote that before reading the next sentence: "According to Marx..." Ok, so now we have context for the argument, a Marxist ideology of class warfare and such. Let's analyze the truth-value of the rest of the propositions. >The bourgeois-proletariat contract, as I would define it, would be the "mutual agreement" upon which labor gives up part of his or her freedom to work for capital. 1. "Capital" is an ambiguous word. Let's use "money" instead. 2. The employee isn't trading freedom for money--that's too abstract--he is trading a certain amount of time and effort for a certain amount of money. >The contract is a, technically, voluntary agreement that the forces of labor sign into whereby they work to produce wealth for the forces of capital who in turn give them some of that wealth in the form of a wage. The author shows bias here by saying the contract is "technically voluntary," suggesting a downtrodden member of the proletariat signing a contract with a greedy capitalist out of necessity, not choice. Sometimes that is true, sometimes it's not, but it's not widespread enough to use a derogatory tone. Another biased phrase is "they work to produce wealth for the forces of capital who in turn give them some of that wealth in the form of a wage." The word "some" is only used when the employer pays employee because the author is implying the employee is short-changed, which isn't true as a general rule. >The forces of capital, owning the ability to provide for the worker, can thus make the terms of the contract and set a wage for which the worker shall receive and this wage can, and as is the case most of the time in the context of big capital, be very low. This "most of the time" assumption is based on a society without a free market, therefore it is useless in predicting free market behavior. >The bourgeois owner knows that in order for the worker to survive they must make a certain amount of money and thus the worker will do most anything to achieve this amount. This is misleading because it assumes the employee is in a dire situation whenever he looks for work. >The worker also knows full well the consequences of not making this amount of money, death. Now we see the far-fetched argument bloom and full-blown Marxism emerge. The world is not made up of downtrodden near-death people looking for work on one side and the hyper-rich debauchers on the other. Not everyone or even the great majority of people looking for work are near death and without any option but to submit to the will of the capitalist. >Thus the worker is given a choice, to accept the contract or die. I reject this as a false representation of reality. When I applied for work at Google, nobody in the company thought I would die if I didn't get the job and I assume that most companies don't believe people will die if they don't get the job. This is blatant warping of reality. >and the worker realizes this as well and is willing to sell themselves to the lowest bidder for work. Why would the worker sell himself to the lowest bidder when there are other bidders? That sounds like the stupidest thing the worker could do. I cannot continue to read this misrepresentation of reality until the above is rebutted or corrected. for that matter) was rigged from day 1... naturally. We live in a system of state backed capitalism. Read capitalism backed by the states monopoly on the use of force. Do you really think the enormous concentrations of capitalist wealth... or let's use 'money' would remain unchallenged without the state's military complex? If power in society was truly balanced wealth distribution would be balanced to. Doesn't it seem obvious this imbalance has/needs protection of some kind? Of course it has protection by force of arms. Of course the playing field is tilted. Of course at the end of the day might still makes right. and obviously like to be on the moral and apologist side of things. because the emperor has no clothes. Obviously a system build on a finite source of cheap fossil fuels was meant to end sooner rather than later. The big oil binge lasted about a mere 7 decades. The biggest field Ghawar was found in 1948. (read cheap) oil extraction was 2006. We are now on a extraction plateau that will soon end. With the peaking of energy extraction goes the collateral for all the debt. on a one time resource. the planet in the mean time. So you go play apologist. But know you are defending an amoral and dying system. I think that you just can do with a few % to power the message house a little bit, however instead of that, that is great blog. A great read. I'll definitely be back. I'm sending it to a few pals ans also sharing in delicious. And naturally, thank you in your effort! Hi there! This blog post couldn't be written any better! Going through this article reminds me of my previous roommate! He continually kept talking about this. I am going to send this article to him. Fairly certain he'll have a very good read.